Great for the little guys! Private lessons: $140 per person (plus Hawaii sales tax and harbor fees of 7.167%) are available at 8:30am and 1:30pm. While there is no minimum age, children 6 and under MUST be placed in a private lesson so an instructor is with them one-on-one at all times. Lessons held Monday through Saturday, Closed Sundays. No 1:30pm lesson on Saturdays. Maui is a great place to learn how to surf, and there is typically a great beginner surf break just outside Lahaina Harbor. Let the professionals at Outrageous Adventures show you the basics. In the two hour lesson you will learn how to paddle and set up for the wave, the proper technique for standing up on the board, and important considerations for your safety. 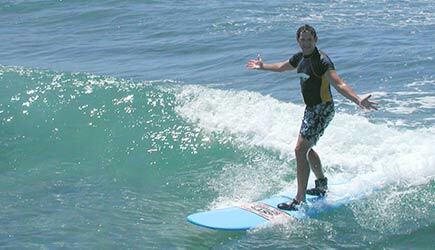 First-time surfers will benefit greatly from a lesson! Outrageous Adventures is SO CONFIDENT that they will succeed in getting you to stand up in your very first lesson that they will do the next lesson for free if you don't ... or even give you your money back! If you know the basics, Outrageous Adventures also does lessons for intermediate surfers to help you improve your skills. To ensure personal attention, group lessons are limited to no more than a 6-to-1 student-to-instructor ratio. Private one-on-one lessons are also available. The cost of the lesson includes surfboard, rash guard, and reef walkers. Group lesson times are 8:30am, 11am, and 1:30pm daily. Private lessons are available at 8:30am and 1:30pm. To ensure your safety, all instructors are long-time Maui residents who know the local waters well, and are certified in first aid and CPR. Checkin is at the Outrageous Surf Shop in downtown Lahaina across the street from the famous Banyan Tree. The spot where the lessons is done is called "Breakwall" and is just south of Lahaina Harbor. For those who want to go along and watch or take pictures, you can walk out on the breakwall and you will be very close to the action! Breakwall is an excellent spot to do these lessons because it consistently receives good waves for beginner lessons no matter which direction the swell is coming. Join in and meet new people with the Group Lessons! Check out this keiki standing on her board! Get out on the water for fun with the whole family! One of our surf instructors on his day off! To guarantee personalized attention, the group lesson is 6 students per instructor. There are 2-4 students per surf class. These lessons are 1 student per instructor. The 2 hour lessons are held Monday through Saturday at 7:30am, 10am, and 12:30pm. Check In is at the Aloha Surf School van at Kalama Beach Park. Surfboard, reef shoes, and rashguard are provided. Minimum age is 5. 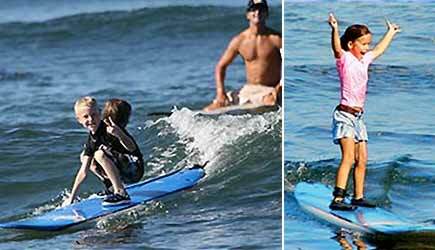 For children 5 to 7 years of age, we recommend a Private Surf Lesson or Semi-Private Lesson with a parent. 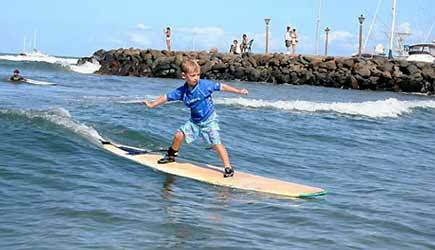 Aloha Surf School offers south Maui surf lessons with elite local instructors. Hawaiian ancestors introduced surfing to the world, and Aloha Surf School provides an authentic experience with the best instructors on the island. They can teach lessons for all levels from beginning to advanced. The ancient Hawaiian sport of He’e Nalu means to ride a surfboard, surfing, wave riding or literally wave sliding. Aloha Surf School honors the knowledge, values and traditions passed on by generations from their ancestors. 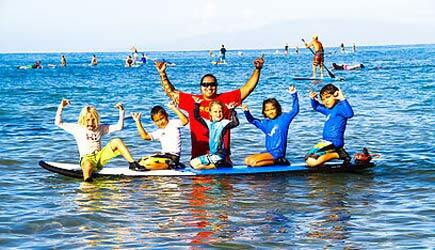 Aloha Surf School's main instructor is Ku’uikaikapu’ali’okekai Kawai. The meaning of his first name is “my strong warrior of the sea”, and people call him Ikaika, Kaika, Kaiks, Hawaiian, Kanaka, or Beautiful. He has been a waterman his whole life, and he's been teaching SUP and surfing for 13 years. 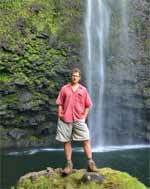 He enjoys sharing the history of surfing, his culture, lifestyle, and giving you an unforgettable Hawaiian experience. 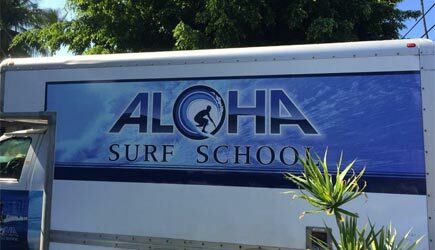 You will check in at the Aloha Surf School van at Kalama Beach Park. They provide Surfboard, reefwalkers, and a rashguard. The minimum age for students is 5. Their policy and GUARANTEE is that everyone will learn to surf at the conclusion of your lesson or the next lesson is FREE! Bad weather comes, good weather comes, too. The sea changes…life changes…we surf on anyway! 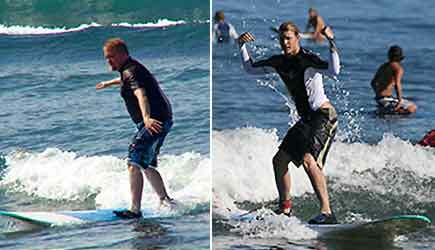 NCL cruise ship passengers in Kahului are able to do a surf lesson on the morning of heir second day in port. Transportation is not included, and is most economically done by renting a car. We can arrange a rental car with shuttle pick-up at the harbor; rates vary throughout the year but start around $40 per day in low season; see our rental car page for more information. Drive time is approx. an hour to the West Mau Surf Lesson or 30 minute to South Maui Surf Lesson. 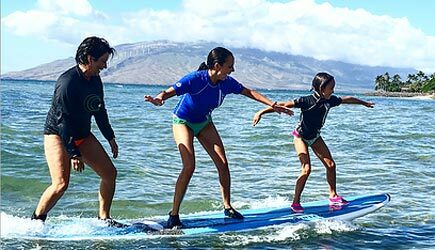 Lahaina cruise ship passengers can do the West Maui surf lesson at either 11am or 1:30pm as long as you are not in port on a Sunday. The walk to the surf shop is just one block from the dock where your cruise ship tenders. Learning to surf is a LOT easier than most people think. While it isn't particularly difficult to learn, it isn't intuitive at all! Some people just go out and rent surfboards and try to teach themselves ... trial and error is a lousy way to learn to surf. There are important issues about balancing your body and particular steps to learn to be able to get to your feet that you aren't likely to figure out on your own. Take a lesson and you will catch more waves while you are here on vacation! Beginners learn on a "soft-top" longboard ... it is a forgiving and stable platform on which to ride your first waves. Rash guards are worn to protect your skin from the surface of the board ... and reef walkers are special shoes that are designed to protect your feet from sharp coral and sea urchins. I often surf the area where lessons are held in Lahaina ... there are a variety of surf schools, but I book with Outrageous Adventures because I KNOW that they do the best job of instruction. I have seen students with other schools who spent most of their time watching their instructor surf without them!!! Don't let this happen to you ... book a surf lessons with the best! Get out there and catch some waves!